The Madison CyberZone offers the best value in Apple and Dell computer systems for JMU students, faculty and staff. We offer enterprise level systems that are reliable and full-featured enough to last four years. Every system we sell can be serviced on campus. With our academic discount, model for model, spec for spec, warranty for warranty, our prices are up to 20% less than the manufacturer's standard retail price. We work closely with the university to ensure our computers have the right components and warranty to receive the highest level of support available on campus. We also work with the individual colleges to make sure we have computer systems that will meet or exceed their recommendations. Other stores may offer lower priced computers, but in most cases, they can't match the reliability or warranty coverage of our systems. Most of our competitors' computers cannot be repaired on campus and must be returned to the manufacturer or retailer for warranty service. Determine the recommended computer for your major/intended major. Review technical specifications and pricing on our currently offered models. We offer Apple and Dell products. Purchase your computer and recommended accessories through our website*, by phone at 540-568-3989, or in the store. Download and install Microsoft Office. *We must verify purchase eligibility before completing a computer purchase. Please include your JAC number in the comments section when ordering an Apple product. Failure to do so will result in a delay of fulfillment until we reach you to confirm your information. 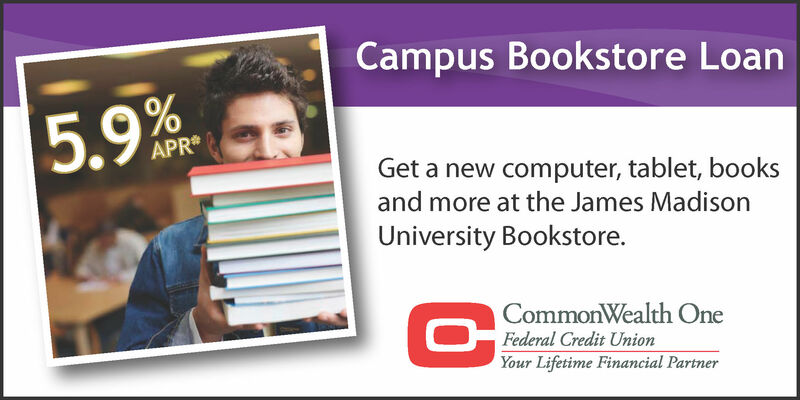 The JMU Bookstore and CommonWealth One Federal Credit Union have partnered to offer you a great option for financing your new personal computer. View the CommonWealth One Bookstore Computer Loan flyer for more information.